Locations: Alameda, CA; New York; Antarctica; Arctic Circle; Illinois; Connecticut; Maryland; Governor's Island, N.Y.; San Pedro,CA; Kodiak, AK; San Francisco, CA; Tacoma, WA; Seattle, WA; Aguadilla, Puerto Rico. I was living in the Philippines and at 19 years old, I joined the Navy. Hundreds of us took the test and only 10 passed. The recruiter asked which of us wanted to be in the Coast Guard and no one raised their hands, so he pointed to several of us, and we were then in the Coast Guard. I went to Alameda, CA, to Boot Camp for three months, then attended additional training to become a Steward. I was then at a base in New York and assigned to the U.S. Coast Guard Cutter Westwind (1964-1970). Our mission was to Antarctica and Arctic Circle. I served as a Captain’s Boy on this ship. In 1970 I became a U.S. Citizen. At this time, I attended three different Navy schools in Illinois, Connecticut, and Maryland, to learn the necessary skills to become a Hospital Corpsman with a specialty in radiology. I served at the USCG Support Center Dispensary on Governor’s Island, NY, from 1972-1974. During this time, I met my future wife, Lu, when I was home in the Philippines. It was love at first sight. We got married in 1973 in Washington D.C.
My next ship was the USCGC Dallas (1974-1976). I served as Hospital Corpsman. In 1976-1979 I served at the USCG Base Terminal Island in San Pedro, CA, serving as a Hospital Corpsman. I then transferred to Kodiak, AK, from 1979-1981 as Chief Petty Officer. At this point we had two children. I was then assigned to Alameda, CA, (1981-1983) and promoted to Senior Chief. I then moved to the Letterman Army Medical Center in San Francisco (1983-1986) as a liaison officer serving Coast Guard patients; then served at the Madigan Army Medical Center in Tacoma, WA, (1986-1989) where we had our third child. In 1989 I was stationed in Seattle at the USCG Support Center as the Medical Administrator for the base clinic. 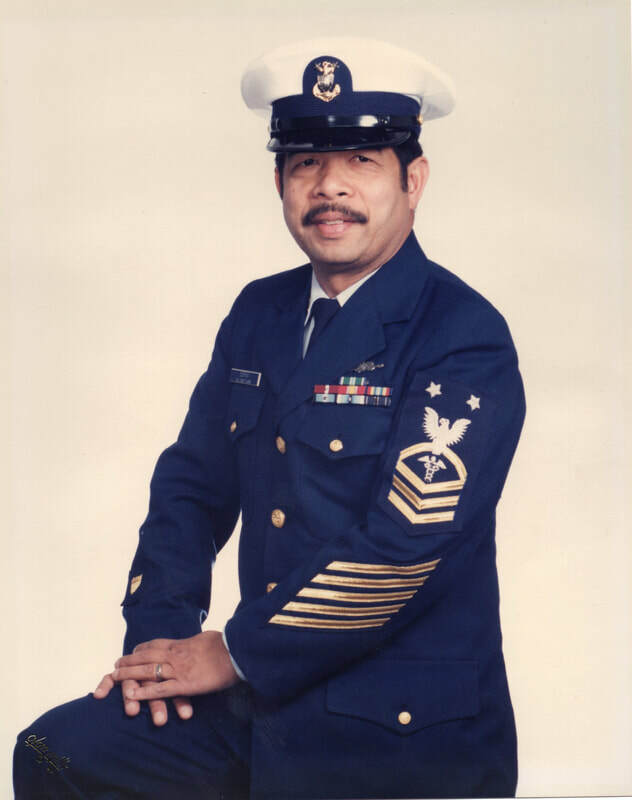 Then in 1991, I was promoted to Master Chief and served in Aguadilla, Puerto Rico, at the USCG Air Station Borinquen. After retiring in 1993, we moved to Lakewood and I went to Cerritos College for two years. I worked 17 years with the Immigration Service in my second career. I am involved with several Coast Guard organizations, and my wife and I are very involved helping community organizations in the greater Lakewood area.